Genetic discrimination occurs when people are treated differently, for example by their employer or insurance company, because they have or are perceived to have a gene mutation that causes or increases the risk of an inherited disorder. It may also refer to any and all discrimination based on the genotype of a person rather than their individual merits. ^ Ajunwa, Ifeoma (2014). "Genetic Testing Meets Big Data: Torts and Contract Law Issues". Rochester, NY. ^ a b Ajunwa, Ifeoma (2015). "Genetic Data and Civil Rights". Harvard Civil Rights- Civil Liberties Law Review. ^ a b c Phillips, K (2014). "Genetic sequencing: Assessing the health care system, policy, and Big-Data implications". ^ Brant-Rauf, P.W. ; Brant-Rauf, S.I. (2004). "Genetic testing in the workplace: Ethical, legal, and social implications". Annual Review of Public Health 25: 139–153. ^ Miller, P.S. (1998). 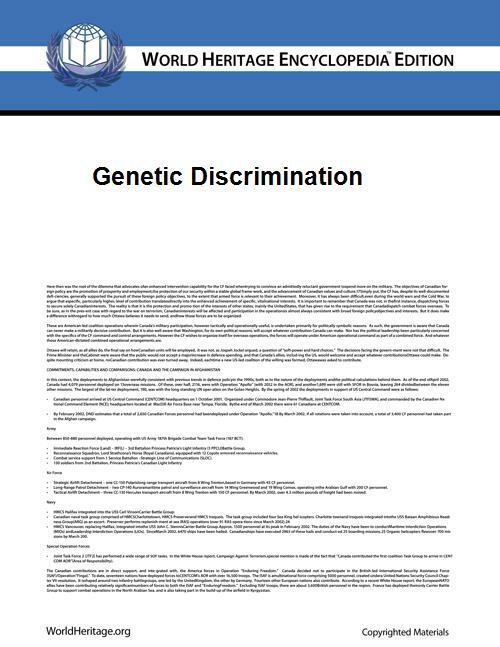 "Genetic discrimination in the workplace". Journal of Law, Medicine, and Ethics 26 (3): 189–197. • The worker must provide informed consent prior to being tested. • Undue expense is needed to protect susceptible workers by lowering the level of the toxic substance in the workplace. • The genetic variation results in an unusually elevated susceptibility to occupational illness. • The genetic test is highly accurate. • The disease must develop so rapidly that monitoring would be ineffective in preventing it. Before the Affordable Care Act, private health insurers were allowed to discriminate patient based on preexisting health conditions. Before this law, it was legal to discriminate a patient actually having that condition under active treatment. In 2008, the New York Times reported that some individuals avoid genetic testing out of fear it will impede their ability to purchase insurance or find a job. They also reported that evidence of actual discrimination was rare. The law does not cover life insurance nor long-term care insurance, which has already created problems for some patients who have undergone genetic testing.